Arguably the most feared group in spheres of mining so far, machete wielding artisanal miners from Shurugwi commonly known as MaShurugwi have invaded some parts of Kwekwe killing as well as terrorising fellow miners. The dangerous group has been on a rampage over the past few years killing people across the country. Reports being received by Zwnews.com is that the group went beserk and bashed people in the outskirts of Kwekwe before forcibly grabbing their gold. “There was reign of terror in Kwekwe last night as MaShurugwi attacked us and robbed us our hard earnings. “We attempted to fight them back, but they overpowered us. I suspect that some of my colleagues were left for dead. l escaped death by a whisker as l had to run away,” said the source. 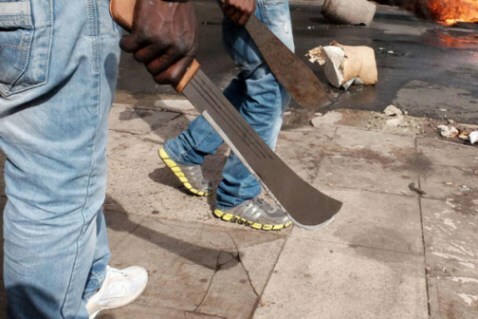 The attacks come at a time when, Innocent Manamike of Rutendo in Redcliff survived a machete attack. He is still nursing many deep cuts and a broken leg. He narrated his ordeal to a privately owned paper in a voice clearly haunted by the pain he endured. “Kwekwe is not for the faint-hearted. The gold mines which used to be a source of income have transformed into rivers of blood,” Manamike says and looks away as if to banish the memory of his torment. On that fateful day, Manamike recalls how he and a friend went in search for gold at the Globe and Phoenix mine (G&P), situated just outside Kwekwe’s CBD, where illegal gold panners converge in search of the sought-after precious mineral. He recounts how disaster struck as soon as they climbed down into the mine shaft and had begun digging for the precious metal. “A group of machete-wielding men came down to where we were and started to assault us. Apparently, they thought we had gold on us and they wanted it,” he recounted. Manamike was left with a broken leg and his friend sustained a broken arm in the attack. Midlands Police spokesperson, Assistant Inspector Ethel Mukwende was not immediately available for a comment of the latest attacks as her mobile phone was not reachable.